While Mesoamerican and African involvement dominates most of the natural history of cacao, cacao’s recent introduction to Asia is of particular interest as it appears to be the new frontier of cacao cultivation and the next chapter of its colonialization. 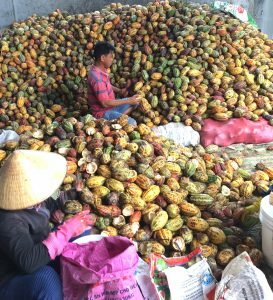 The West has flirted with cacao production in Vietnam on and off for over a century, and it has seen a resurgence in the past decade as it has once again been targeted as a viable region for production expansion given shortages of supply for growing demand. In the late 19th century, the French attempted to establish cacao growing, much like it had in other regions in the world, but it proved to be unfruitful as coffee was far more profitable, and thus the efforts were abandoned. Few trees remained, but no significant inclusion to Vietnamese culture occurred. Cacao saw a brief resurgence in the 1980s after the war out of its dependency on the USSR. Cacao was planted to supply Soviet demand for chocolate, but by the time the trees produced pods, the Berlin Wall had fallen and demand disappeared prompting frustrated farmers to cut down most of the cacao trees. Vietnamese Cacao Farmer In the third iteration of cacao cultivation initiatives introduced by Western entities, free seedlings and training were offered to local farmers in Vietnam in order to elevate the quality of living and economic standing of small farmers; Cacao was touted as means of transforming the well-being of poor farmers. The organizations responsible for this reintroduction, USAID, USDA, World Cocoa Foundation, Mars Inc., and ACDI/VOCA, developed SUCCESS, or the Sustainable Cocoa Enterprise Solutions for Smallholders, and have increased the number of hectares of cocoa from 1,600 in 2004 to 6,500 in a span of 7 years. 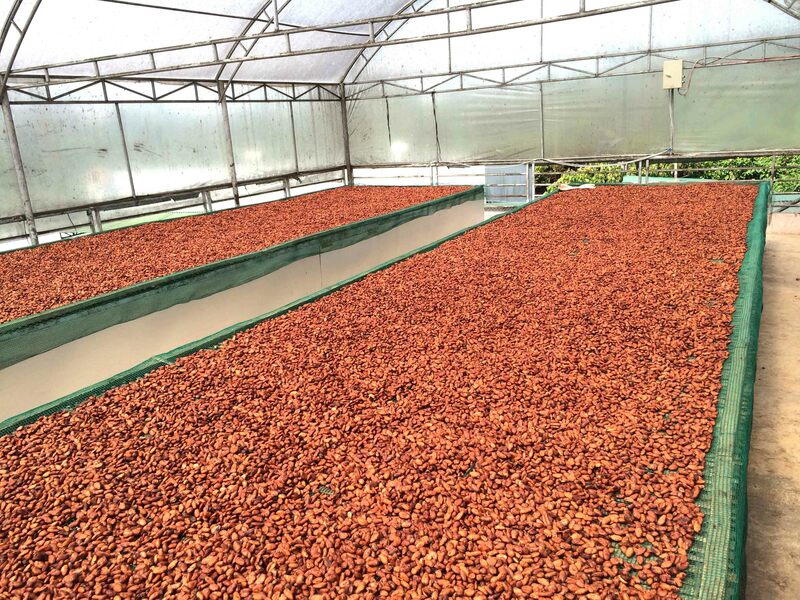 It seems like a win-win relationship between chocolate producers/consumers and cacao farmers as that number has skyrocketed to over 20,000 hectares today. As a shade crop, the cacao trees do not interfere with the farmers’ main crops, and can provide upwards of $1,000 in supplemental income, on average, from about half a ton of cocoa. Additionally, from a Western perspective, Vietnam is coveted due to its lack of political instability so omnipresent in other regions of the world with favorable growing conditions as well as a culture of focused and goal oriented farmers. This seemingly mutual relationship, while optimistic, is intrinsically tied to foreign demand and still overshadowed by Vietnam’s main exports of rice, coffee, cashews, etc. It’s a dynamic that contributed to Vietnam’s abandonment of similar efforts in the past. Despite Vietnam being a critical link in closing the supply/demand gap of cacao’s industry, who is truly profiting from its expansion? History appears to repeat itself as Western manufacturers profit from, not only the cultivation by foreign hands, but their cultural heritage as well, in a bid to further authenticate exotic goods. From an economic perspective, the Western monopolization of the distribution and post production of Vietnamese cacao is similar to that of Spain’s stranglehold on the New World, as all goods were to be imported from the mother country. Cargill, a company based in Iowa, provides market access to Vietnamese farmers and imports 70% of all cacao grown in Vietnam. 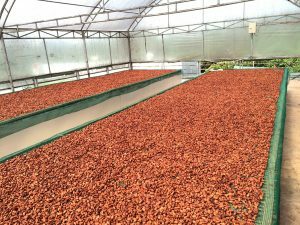 While less explicit than its predecessors and armed with more a more mutualistic proposal, Vietnamese cacao is still vastly more profitable to the foreign market than domestically, and the socioeconomic inequities found in Latin America and Africa are likely to resurface as Vietnam grows to become a major player in the cacao industry.